Ahhh - remember the good old days prog fans, when you could march down to your local record emporium, lay down your pound note and skip out with the latest waxing from King Crimson / Yes / Genesis / Jethro Tull / et al tucked under your arm? Remember the feeling of anticipation as you carefully lowered the arm of your Toshiba into the grooves and covered your ears with the sweaty pads of your top-of-the-range Koss headphones? 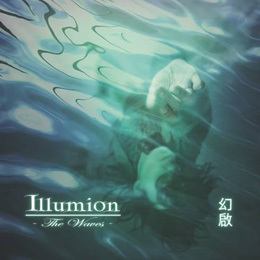 Well, happy days are here again with this fabulous release from Dutch neo/symphonic progmeisters Illumion. The album comes as a double vinyl / CD package of exceptional progressive rock that wraps you up in that cosy blanket of nostalgia yet is sufficiently contemporary to appeal to all fans of the genre. Lead by the stunning guitar work of Eveline van Kampen (yep, a woman who can play progressive rock guitar) and the sweetly powerful vocals of Esther Ladiges, the band push all the right buttons on an album of remarkable diversity. Swinging from the staccato riffing of opener ‘Ember’ to the pastoral piano figures of ‘A Tale Of Kings’ and all points in between, interest is sustained throughout the nine tracks by the quality of the musicianship and enhanced by the introduction of eclectic instruments such as Chinese zither, trumpet, mandolin and Chinese spike fiddle. Top this off with an appearance by the current doyen of Dutch prog, Arjen Lucassen and you have an exceptional piece of work. There is definitely something in the water in the Netherlands at the moment – the recent releases by the likes of Toyz and Gate 6 and the resurgence of Focus are examples – and it is quite clear that Illumion have been drinking from the same source. I hope the fact that this is a vinyl-only release doesn’t hinder the album’s success (although I fear it will) as something this fine deserves a wide listening.